The paperback of my brother's third book, 'Blood Water' has been released. Something unspeakable took Gerontius Moore’s parents from him, leaving him orphaned and alone. Now, that something, is back. Caught up in a terrifying hunt and finding help from an unlikely source, Gerontius must once more flee the clutches of an appalling beast, before it learns its business is unfinished. Full moon or not, the hunt is on. When young magazine journalist Ashley Reeves receives an intriguing letter, he leaves his London office in the hope of reporting on an unusual species of insect - the Ganges Red. That evening he arrives on Aries Island and encounters the writer of the letter - Reginald Mather. At first Mather seems no more than an eccentric collector, happy to live in isolation on the island. But when Reeves unearths the horrific truth, he finds himself thrown headlong into a macabre nightmare that quickly spirals out of control. 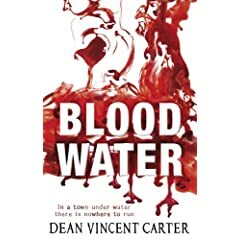 His life is in danger ...and Mather is not his only enemy ...Both gruesome and compelling, chilling and page-turning, this much-anticipated thriller from Dean Vincent Carter will delight older readers. Disappeared for 2 weeks to hike the Pennine Way with my brother Dean (above right pic). 256 Miles (although we covered 270-275 with diversion) in 12.5 days. It was supposed to be a holiday break but soon became a real test of stamina. I’d say it was even harder than completing the 950M and 1050M Lejog in the same time. We came away with numerous blisters, aggrivated ITB, sore knees and pulled muscles, from lugging the 15kg backpack up and down the Pennine’s best hills. Great challenge though, we enjoyed it and want more. Definitely recommend this one! A tough climb from Upper Booth up Jacobs Ladder. The body wasn’t prepared for the steep climbs with the weighted backpack. Took a wrong turn at Kinder Downfall in bad visibility. Spent 2 hours negotiating peat bogs but kept to a northerly compass bearing that took us to the edge of the cliff. At this point we passed a couple we’d met earlier that confirmed we were back on track. Original plan to do 16M and reach Crowden went out the window so decided to divert 2-3M off course to Hayfield down the side of Mill Hill. Had a few beers in the town that evening. Left Hayfield around 7am and proceeded back up the long climb up a stream to Mill Hill. Featherbed Moss had some great views, as we followed a stoned path over the mountains. Continued to Devil’s Dyke and Shelf Moss. The path here died out as the terrain became very sandy. Looked more like the dunes off a beach than Pennine hills. We reached Crowden at 2-3pm but decided to call it a day as we were already quite tired. Bought loads of food from the camp shop and proceeded to stuff ourselves silly using the camp stove. We were a bit worried at this point that we may have asked a bit too much of ourselves on this ‘trip’. We planned 20-22M/Day with a day in hand. But at this point we’d effectively already used-up the spare day and were struggling to reach 10M/Day. I had already developed 4 blisters, but then I hadn’t exactly broken-in the new boots adequately. Midges were out in force again. We would have a few more days of suffering and then would hardly see any again! We went a bit overboard here. 33M in one day (30M of the route), to try and catch up! Headed out at 6-7am and began a long climb up the edge of Bareholm Moss. This was probably one of my favourite parts of the whole trip. It took a few hours to reach the top but the view, particularly at that time of the day, was amazing. Over Black Hill and down to Standedge. We didn’t want to divert a few miles to the nearest village so we stopped off at a pub for the usual lift – beer, chips, coke. Continued through the hills over Little Moss, Blackstone Edge, etc (great views again) and past a few reservoirs (had a brief chat with a cyclist who recognised my wind-beaten face. Bit strange cos he had no interest in triathlon). Instead of stopping at a Youth Hostel in Mankinholes we decided to press on to make up some ground (we were behind our schedule by 15M now). At Hebden Bridge we spotted an elderly lady walking her dog and asked for directions to nearest shop/garage. Nothing for a few miles but she said we could refill our waterbottles from her garden, which was actually on the PW. We had to find the house opposite the green car and just make our way around the side of house and use garden hose. So we went ahead of her, found the house (with lights on – presume security measure) and headed round the back to help ourselves. She caught up 5mins later and told us we were in the wrong house – I have visions of some poor old dear frightened to death as two blokes help themselves to their garden! Some nasty climbs out of Hebden bridge through what seemed like unpassable slopes and backgardens. It started to get dark and around 9:30pm we had to wild camp between two streams (Graining and Alconden Waters) at BlakeDean. A good experience but we were both hungry and thirsty at this point and tired from the 33M of hiking. Woke up at 5:30am. We were both very hungry and thirsty at this point. Dean sterilised some of the river water. But even with the taster tablet it looked and tasted pretty rank. We spent the rest of the morning on empty, quite painful, not a pleasant experience. Having passed a few reservoirs we headed up into the hills and Upper Withins. Rather than continue through Ponden reservoir we took a 2-3M detour to Haworth (of Bronte fame) and recharge. This time we made sure we bought enough supplies for two days (although they didn’t last long). Chocolate biscuits were the best for cals/p value. Continued on to Cowling campsite (£3) - just a field full of Hens next to someone’s house. Blisters getting worse. Had around 6 on the go at this point. Luckily I’d brought my trainers with me so rotated between them and the boots to give my feet a breather. I was also finding that my little toes were becoming cold but slightly purple/inflamed due to compression as my feet slid forward on the rocky hill descents. Halfway point today was Thornton in Craven. A pattern would emerge for this and subsequent days where we’d feel close to exhaustion around mid-day. But, following a good food break we’d be fit enough to continue for several more hours. We reached Malham in good time but I couldn’t bear to walk a further mile, even to the local pub due to the blisters. Still around 14miles behind schedule. Slow walk to and over Malham Cove, and on to Malham Tarn. Continued through Horton (café). Hobbled in to Hawes Youth Hostel around 8pm (after 28M of hills we needed a good rest). Started quite late (9am), making the most of the Hostel. Crisp and clear to start but misty, dull weather as we headed towards Great Shunner Fell (720m). The last few hundred metres up Shunner Fell were tough. Like most of the PW the tracks would die out over stoney ground and, in this case, we found ourselves scrambling up over large rocks. With a strong wind and backpacks it wasn’t pleasant. Took a break on the top and cooked up some food at the cairn shelter. Later we passed through Thwaite (cafe) and Keld. ...before deciding to press on towards Bowes. There was a campsite marked at East Mellwaters, but having reached the field we found nothing. It was already dark and we were a few miles from Bowes so we knocked at the farmhouse door. After a long chat with the friendly landowners we came to an agreement that they would let us have the whole of their (work in progress) spare Guest House to ourselves for just £5 each. Luxury. Best nights sleep I’d had in ages. Now 11M behind schedule. Tough going today. Second of two consecutive distance-days to catch up with our pre-schedule. Walked a mile to get back on the Pennine Way at Pasture’s End. The rest of the morning was quite relaxing with good views over the moors of Cotherstone and Deep Dale, passing around the villages/reservoirs of Baldersdale and Lunedale. In order to catch up some mileage we decided to Pass through Middleton. We were now both very tired but had enough food to snack on for the rest of the day. The route follows river Tees for several miles. We thought this would be easy going but it was rocky underfoot like most of the way. This is how the blisters came about – slipping of the feet on the sides of large stones. Slow progress. and passing the Mountain rescue station we found ourselves in marshy hills looking over the Beck. There were danger signs either side of the path but, with 4-5miles to Dufton, we had to set camp. So where did we go – the only non-marshy bit of land was down by the Beck on a bed of thistles, next to the river and with Fords running down the hill either side of us. So as I lay awake in my tent at 550m up I thought - thank god it’s not raining. And what should happen soon after……rain and gales! I spent whole night checking my tent, listening to the river and padding the ground. And my brother slept through it all(!). At least we were only a few miles behind schedule now. With Maize Beck in the early hours and the scares of Great and Little Dunn Fell Hills later in the day, this had to be the most exciting/adventurous 24hours Id ever had. The day started with a 4mile section through the mists of Dufton Fell hills and marshes as we approached the spectacular High Cup Scar. I couldn’t believe the sheer scale of it. From the cold mists you could see right down the scar to the bright village of Dufton below. In Dufton we bumped into another PW-er, Magnus Moorhouse. He was walking from Lands End to John O’Groats via Pennine Way. A really friendly bloke, who we’d meet up with a few more times over the following days. We didn’t realise at the time that he was doing this to raise money for Cance Research having lost his mother to cancer just 3 years previous. We let him head off for the first of four major peaks; being Green Fell (800m), Great Dunn Fell (850m), Little Dunn Fell (840m) and Cross Fell (900m), while we stocked up on nutrition at Dufton’s Youth Hostel. After a coupel of hours of climbing into the mists of Green Fell we saw someone heading towards us. Turned out to be Magnus. He said he’d done the PW before, but got a bit lost around the main Cairn. This made me think, if an experienced hiker gets lost in these conditions, then what hope have we got! We rested briefly at the summit (too windy to stop for more than a minute) and headed on. The route to Great Dunn Fell was terrible and I swore a loud many times as the path disappeared into rocks and mist. We eventually came to a path/road that wound up the hill to the radar installation and I thought would be better to take this. Knocked about the road from the gales but we reached the station. However, by now the mist was blowing so strongly that visibility went down to about 30m and we couldn’t find the path. We were getting cold so we took sheltered side of the station and put all our clothes on. Very worrying time because we were hours from any dwelling and no-one in the station. I knew I couldn’t stop for long as didn’t have much fat insulation and clothing not adequate for these conditions so we pressed on. I was also just as much worried for my brother. If one of us had a problem with the cold then we’d be in trouble. Luckily, having circled the complex we found what looked like a small (trampled) path. It led to stone slabs and we started to warm up. The rest of the peaks were also tough to navigate with the marshes, rocks and fords that looked like paths from a distance through the mist. But we eventually got through it. Took a break in Greg’s Bothy (mountain hut) as we headed down long rocky road to Alston. Funny how surreal it is when you pass through the mists to warmer weather and clear vision. You wonder what all the fuss was about!!! Exhausted when we reached Alston and happy to spend anight in the local Youth Hostel and get our wet clothes washed and dried. We didn’t get any provisions in Alston which in hindsight was a mistake. Route planner had a Post Office marked at Slaggyford (nice name). Turned out the shop had closed 6 months previous. So Dean and I were on empty again, and no shops for another 8miles (11miles in total). Heads down for a while. My blisters were killing from damp boots and Dean also had a bad leg. Had a big argument at one point. But finally reached Greenhead and the pub and café in the centre. Path continued up to and beside Hadrians Wall. Awsome views and a tough little walk up and down the fortlets and lookouts. After 4miles of this we turned south towards Twice Brewed campsite. Met another interesting guy there, Tom Brett. 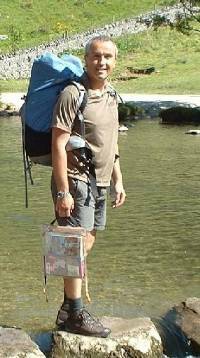 A well informed man who’d written various reports and papers on viruses, was a keen hiker and a qualified foot specialist. Although I didn’t follow his advice of weeing on my feet first thing in the morning to treat blisters! We had a few beers with him at Once Brewed Pub. Very cold night. We’d been warned that Winshields was a meeting point for two weather fronts and got very cold. I wore everything I had so no problems. Ate and bought a load of bacon and egg buns from the campsite, then continued up and along Hadrians Wall. Clear sky and great views again. After a couple of miles we headed West towards the forests of Henshaw Common. While taking a break in the Forest we were caught by Magnus (he would start later than us, but at a quicker pace). We walked together for most of the day before letting him push on towards Bellingham. This was a bad day for me and I struggled to keep up with them. I ensured all blisters were now popped and uncovered. The concern now was more for my little toes that had become increasingly swollen, cold and off-colour as the hike progressed. I was losing feeling in them and prob as a result of the weighted downhills, as my feet pushed to ends of boots, trainers. Just wanted to get through the next 2 days. I’d know then that I could finish the challenge. I didn’t want to have to pull out and leave my brother to go alone. Wanted us to complete it together. We glad the mileage was a lot lower today. Arrived in Bellingham campsite around 4-5pm, and stocked up again on food. Penultimate Day and we wanted to take it as easy as possible to save some energy for what could be the toughest day of the lot over the Cheviots. Magnus caught up with us again just after Whitley Pike. We headed towards the woods beyond Blackburn Common. Gorless Crag was a tough section. A steep climb between a stone wall and edge of forest over boggy ground. I had to try and scramble over the wall as I had trainers on. Rest of day spent on undulating terrain and down a track to Byrness village. A strange little settlement built into middle of the forest, a little oasis for hikers. Shattered again but glad of extra rest. Started early. A long steep ascent through the forest, cutting a path through cobwebs to summit of Byrness Hill (410m). On to Houx Hill (490m) and then down and up to Ravens Knowe (530m), before cutting steeply downhill to the Roman Camps and Fortlet of Chew Green, where we took a break amongst the minefield of sheep crap. Climbed up to the first mountain refuge hut before Lamb Hill (510m). Next few hours spent up and down various other hills at Beefstand (560m), Swinside Law (460m), Plea Knowe (500m), Barrow Law (420m), Ward Law (470m), Little Ward Law (490m) and Windy Gyle (620m). We then passed Clennel Street. Strange name for a (old roman) path that runs straight over the hills but used to be acient border crossing. Continued over Kings Seat (530m), Cairn Hill (740m), before heading west again and stopping at another refuge hut. We were now exhausted and the final climb to Schil (600m) hurt! 7 more miles to the finish and despite being downhill each step was hurting the feet. Several stops to take a break. The last mile was longest of the lot, with a nasty uphill road to then lead down into the village of Kirk Yetholm. So glad to have finished. We signed ourselves into The Border Inn Pennine Way book, had our free drinks and then returned later for a meal. So we did it. It was much harder than I possibly could have imagined. I’m finishing typing this 11 days after completing the Pennine Way and my legs still havn’t returned to normal. They are weak (particularly around the knees) and sore, stiff. But I’m just getting back from it. I have a 10k next week and will be interesting to see how well/badly I do in it. We both enjoyed it though and are keen to have another rlittle adventure, possibly the Coast-to-Coast in 2008 or 2009. This time we’ll give ourselves 15mile days rather than 20-25! great report Daz you should post it in the events section so it get read more. ps will your brothers next book be about the horror of spending two weeks with you ? I currently coach 25 triathletes, and provide nutritional support/analysis and personal training to any level of athlete. Click logo above for more details.